Minnesota Wild fans came into the Xcel Energy Center expecting to see the Wild throttle the Edmonton Oilers and advance with an easy win; the Oilers surprised both Minnesota and perhaps their own fans by pulling out a 6-1 victory over the stunned Wild. The game started out explosively, with Edmonton’s Mike Brown and Minnesota’s Zenon Konopka duking it out only two seconds into the game. Edmonton thrived off this energy and with less than 30 seconds elapsed on the clock, Corey Potter swooped in with Edmonton’s first goal of the night. Taylor Hall increased the Oilers’ lead with a wrist shot that flew past Minnesota Wild goalie Niklas Backstrom. Not content with the one goal, Potter added a third goal to the Oilers’ surprising lead with a goal at 18:38. The Wild pulled Backstrom and put in goalie Josh Harding. It was a thrilling first period. Minnesota had triple the shots in the period, outshooting the Oilers 15 to 5, yet Nikolai Khabibulin managed to save every single one so far. The Oilers wrapped up the first period with a 3-0 lead. In the past, the Oilers have occasionally managed to squander fairly strong leads in the second and especially third period, but that wasn’t the case in this game. They kept up a high energy level and hustle despite their comfortable lead, and tacked another goal onto their total. Jordan Eberle received a great pass from Ryan Smyth and made a phenomenal shot over Harding’s left shoulder. The Minnesota Wild couldn’t seem to get their bearings and 10:13 into the second period the Oilers continued to increase their fantastic lead with a goal by Nail Yakupov with an assist by Hall. The Hall-Yakupov team triumphed again only 4 minutes later, as Hall fed a great pass to Yakupov, who buried the puck once more. 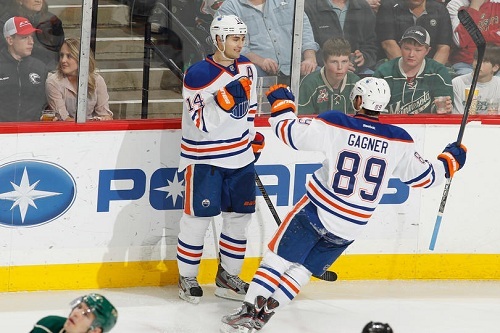 The Oilers wrapped up the second period with a doubled lead, now dominating the Wild 6-0. Not only did they manage to get 6 goals, but they did it while being outshot in both periods; additionally, Edmonton’s goals have all been even strength goals without even a power-play to assist them. Edmonton surprised everyone coming out with such energy and so far was managing to spoil Minnesota’s evening of anticipated celebration. Jordan Eberle and Sam Gagner of the Edmonton Oilers celebrate one of the Oilers’ many goals against the Minnesota Wild on April 26. The Wild prevented a shutout by finally getting on the scoreboard with a goal by Mikko Koivu at 9:42, but there was really no bouncing back from a 6-0 lead with only ten minutes remaining. With an incredible performance by Khabibulin, who made 38 saves, and fantastic play by the Oilers, Edmonton closed out the game with a 6-1 victory. “We came here to spoil their party and we did,” a triumphant Hall interviewed after the game. While the Oilers aren’t going to the playoffs, a blowout win like this can only help their confidence as a team. They’ll face the Vancouver Canucks on Saturday, April 27.